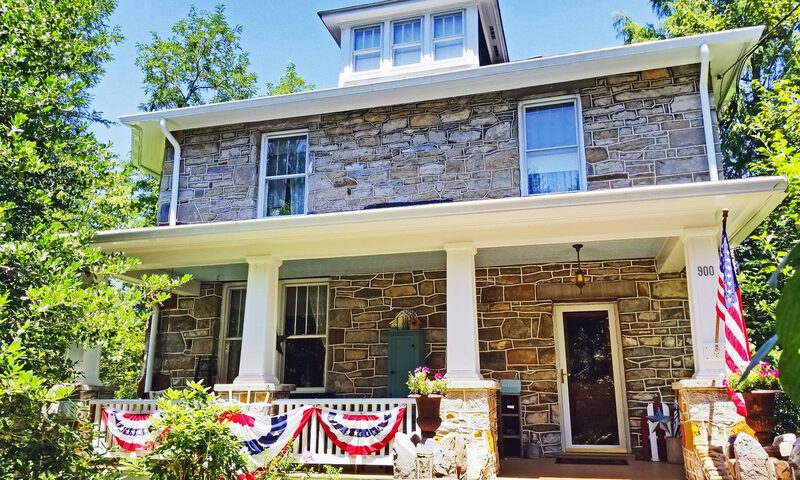 Rockhaven B&B – Relax and refresh in historic Harpers Ferry, W.Va.
Rockhaven B&B is the perfect place for a tranquil getaway. It’s a welcoming home where you can relax after a day of exploring Harpers Ferry National Park, biking the C&O Canal Trail, hiking on the Appalachian Trail, rafting on the river, tasting Loudoun County wine offerings or just escaping the big city madness. The industrial-vintage style Studebaker Suite with a private entrance at garden level. The romantic cottage-style Inez’s Sweet Retreat comprising the entire third floor of our Craftsman-style 1927 stone foursquare. Rockhaven is within easy walking distance of the Harpers Ferry National Park yet far enough away from the train tracks that our guests hear only a distant wail if any sound at all. Several good eating establishments with convenient dinner hours are also within walking distance. It’s definitely a sweet spot for couples, but it is also ideal for solo adventurers, writers and artists. With nearby views of the Potomac and Shenandoah Rivers, Rockhaven is also within walking distance of the C&O Canal Trail, the Appalachian Trail (we’re only 1 block from the AT Conservancy visitor center), the Amtrak/MARC train station, and Storer College. Upon request, we can provide transportation to and from the train station. We just opened the B&B in June 2017, so both suites are very fresh and modern. The Studebaker Suite is brand new construction opened in February 2018. Contact us with questions at info@rockhavenbnb.com or call 304-535-8235. – Breakfast food comparable to a Complementary breakfast at a hotel but better because you don’t have to leave your room! – The mattress is Absolutely wonderful memory foam, and the down comforter will make you want to stay in bed all day. – The bath tub is AWESOME! Gorgeous chandelier hanging over the tub with mood setting lighting. Read more reviews on our Airbnb listing. Please note that this is a non-smoking property. Smoking is permitted outside the property fence only. Continental breakfast will be stocked in your kitchenette. 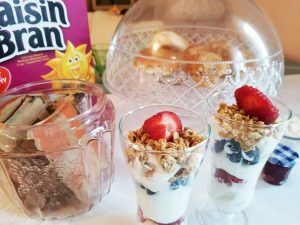 A continental breakfast will be left in your kitchenette that will typically include fresh fruit & yogurt parfaits and pastries/bagels, as well as Raisin Bran, instant oatmeal and granola. Coffee, tea, and creamer will always be there. Milk and/or orange juice can be provided upon request. Guests in both of our suites are welcome to hang out on our big front porch (on the porch swing, of course) or stroll through our lush gardens and relax in the gazebo. Kitchenette space with mini-fridge/freezer, microwave, toaster, Keurig coffeemaker, sink and dishware. We can safely accommodate your bicycle or motorcycle.